I believe in the cause of helping women become fit and fitter, looking after their health and giving time to their body and mind. I am also very keen on promoting events that aim to promote fitness in a woman’s life! And so – NCR’s biggest women run – The 10k Women Run has my full support. The Registration Link to it is here. Am blogging on women who inspire a lot of us! I have on the blog today – Ranjana Deopa. Going from strength to strength from Running, to Swimming, to Cycling and becoming a Triathlete! 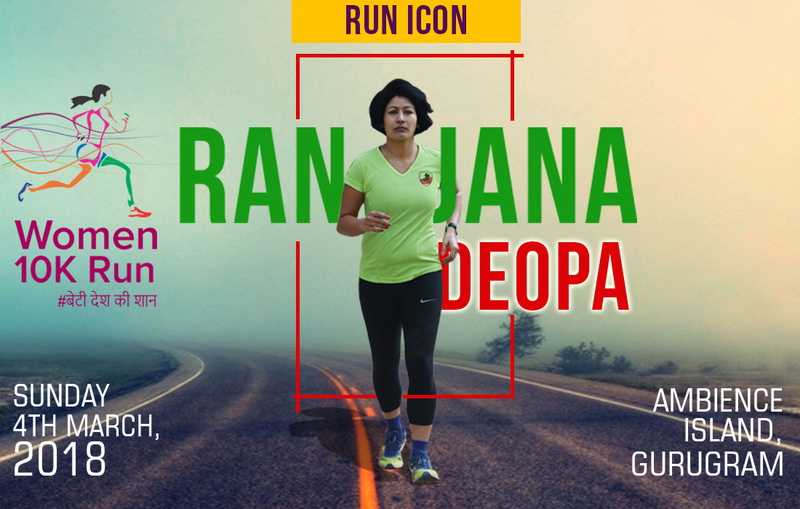 Currently, she is actively promoting the Women’s 10k Run in NCR Region. How have you built your fitness regime since the time you took fitness seriously in your life? I had no serious fitness background to begin with when I took up running. My initial running days was all about solo running before I joined West Delhi Runners. Learnt a lot from my fellow runners about building Fitness, a routine, diet etc. I built my mileage gradually for my first 21 k in 2012. Progressed to a full marathon in 2014 and since then ADHM and TMM have been my main events for HM and FM categories. Also, did my first and only brevet of 200 k in 2014. My only Ultra run is Garhwal 76k in 2015. It’s been 2 years that I took up triathlons with my first event being a half iron Man distance at Delhi Triathlon championship in 2016. So it was a lot of focus on building endurance by training, diet and strengthening exercises followed with proper rest and recovery. Swimming was a big challenge as I could only swim 25 m at a stretch and would be breathless when I started my training. Gradually built my technique in the pool and then started training at Lake Bhardwaj for open water. My first open water swimming event in Thonnur Swimathon, Mysore for 2.5 km in 2015 gave the much needed confidence for my first half Ironman in Bahrain 2016. Since then it’s been about balancing time and effort with swimming, cycling and running . What fitness activities do you do? Gym session for strengthening and weight training, thrice a week. Core and stretching 4-5 times a week. What is your food intake like? (your diet, any special focus on carbs, proteins, fibre)? I am an eggtarian and one of the main sources of protein is eggs for me. Besides this it’s a lot of healthy greens, rice, dal etc. I have developed gluten intolerance and try to avoid wheat and maida. I am serious about supplements like vit D, calcium etc. Very low on carbs for dinner. I definitely take a protein shake- Whey after a long workout. I don’t take any special diet or any special foods. I stick to seasonal vegetables but I do put a consistent effort in covering all the food groups. I have conquered the itch for sugar in the last few years. I eat natural sugars that are present in fruits an some dry nuts. A few points of wisdom you would give to women entering their 40s about their health and fitness? What should they do? Health check up for spouse and self are mandatory. I ensure my check up before I renew my health policy every year and haven’t missed it for last 5 years. I feel that the average Indian takes it for granted and has to pay for the ignorance later in life. So take your tests seriously and whatever deficiencies you have cover them up as soon as you can. Diet control…less or no sugar and no fried food . Our metabolism slows down with age and we suffer a lot. The age demands that we watch our diet at every stage. Fitness routine– Could be Yoga, Gymming, Walking, Swimming etc. or a combination to keep the interest going. Basically keep trying different and variety of routines to keep your interest in fitness for at least an hour everyday.